ഫാബേൽസ് നിരയിലെ ഒരു സസ്യകുടുംബമാണ് പോളിഗാലേസീ. (ശാസ്ത്രീയനാമം: Polygalaceae). ഇവ മിൽക്‌വേർട്‌സ് (milkwort) എന്നാണ് അറിയപ്പെടുന്നത്. 21 ജനുസുകളിലായി ഏതാണ്ട് 900 അറിയപ്പെടുന്ന സ്പീഷിസുകൾ ഈ കുടുംബത്തിലുണ്ട്. കുറ്റിച്ചെടികളും മരങ്ങളുമെല്ലാമുള്ള ഈ കുടുംബത്തിലെ പകുതിയോളം സ്പീഷിസുകൾ പോളിഗാല ജനുസിലാണ്. ↑ Abbott JR. (2011). "Notes on the disintegration of Polygala (Polygalaceae), with four new genera for the flora of North America". Journal of the Botanical Research Institute of Texas. 5 (1): 125–137. JSTOR 41972495. ↑ Pastore JFB. (2012). 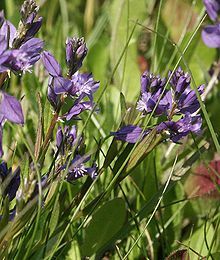 "Caamembeca: Generic status and new name for Polygala subgenus Ligustrina (Polygalaceae)". Kew Bull. 67 (3): 435–442. doi:10.1007/s12225-012-9360-x. ↑ Pastore JFB, Rodrigues de Moraes PL. (2013). "Generic status and lectotypifications for Gymnospora (Polygalaceae)". Novon. 22 (3): 304–306. doi:10.3417/2010113. ↑ Abbott JR, Pastore JFB (2015). "Preliminary synopsis of the genus Hebecarpa (Polygalaceae)". Kew Bull. 70: 39. doi:10.1007/s12225-015-9589-2. ↑ Freire-Fierro A. (2015). Systematics of Monnina (Polygalaceae) (Ph.D.). Drexel University. ↑ Persson C. (2001). "Phylogenetic relationships in Polygalaceae based on plastid DNA sequences from the trnL–F region". Taxon. 50 (3 (Golden Jubilee Part 5)): 763–779. doi:10.2307/1223706. JSTOR 1223706. ↑ Abbott JR. (2009). Phylogeny of the Polygalaceae and a revision of Badiera (PDF) (Ph.D.). University of Florida. ഈ താൾ അവസാനം തിരുത്തപ്പെട്ടത്: 13:51, 10 മേയ് 2018.